When planning a synthesis of simple aromatic compounds, it’s not enough to pick the right reactions. You also have to put them in the right order! If you’re not careful, you may end up making a para– product when you meant to make a meta- , or vice versa! Up to now, we’ve covered electrophilic aromatic substitution [6 key reactions] [mechanism] [ortho-para-meta] and then the reactions of aromatic substituents [bromination & oxidation] [carbonyl reduction] [nitro reduction & Baeyer-Villiger]. So what?! All we’ve done is assemble a workshop full of gleaming new tools. We haven’t actually used them for anything yet! So let’s start putting these reactions together in sequences with the goal of building specific molecules. We’ll begin with a key principle for planning the synthesis of disubstituted aromatic molecules. In planning a synthesis, the order in which reactions are done can have a crucial impact on the outcome! In this example, the bonds that form are C–NO2 and C–Br , and the bonds that break are C–H and C–H. “What reactions do I know that form and break these bonds?“. So is that all there is to it? Almost. This is where “order of operations” rears its potentially ugly head. If we just barrel along, doing bromination first and nitration second, what happens? 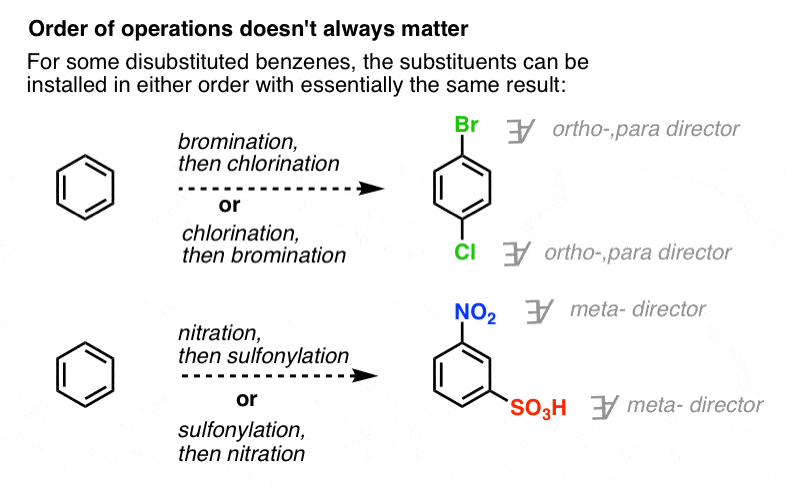 Since the first reaction (bromination) installs an ortho-, para- director, the second reaction (nitration) will result in the undesired para- and ortho- products. Since we want the meta product, the first step should be installation of a meta– director (nitration) followed by bromination. The bonds that form here are two carbon-carbon bonds: C-CH2CH3 and C-C(O)CH3 , and the bonds that break are two C–H bonds. As we said, however, this isn’t enough. We need to think about the order of operations. 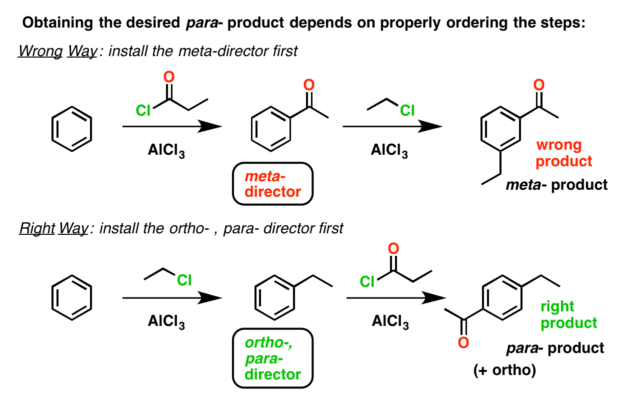 The wrong way to do it is to do the Friedel-Crafts acylation first, which installs a meta director (the ketone), giving us the meta product upon Friedel-Crafts alkylation. In the next post, we’ll add another wrinkle to this “order of operations”; changing the nature of the directing groups. Here are three quiz examples. How would you synthesize each of these three molecules? Which operation comes first? Are there cases where order of operations doesn’t really matter? Of course. For our purposes, when we are planning the synthesis of a disubstituted benzene with two ortho-, para- directors or two meta- directors, the order of operations doesn’t matter. two halogen substituents (bromine and chlorine) para to each other? Take your pick of which reaction to do first. nitro and sulfonyl oriented meta? For our purposes, either way is fine. There is one complication, and since it isn’t addressed in many courses, I’m relegating it to this place at the bottom where relatively few people will read it. The issue has to do with the Friedel Crafts alkylation and (to a slightly lesser extent) the Friedel-Crafts acylation reaction. It turns out that Friedel-Crafts reactions don’t work particularly well when strong electron-withdrawing groups (i.e meta– directors, particularly NO2) are present on the aromatic ring. The issue isn’t so much that carbocations are poor electrophiles (alkyl carbocations are among the most powerful electrophiles known) – it’s that the reaction with electron-poor aromatic groups tends to be slower than side-reactions between the carbocations themselves. 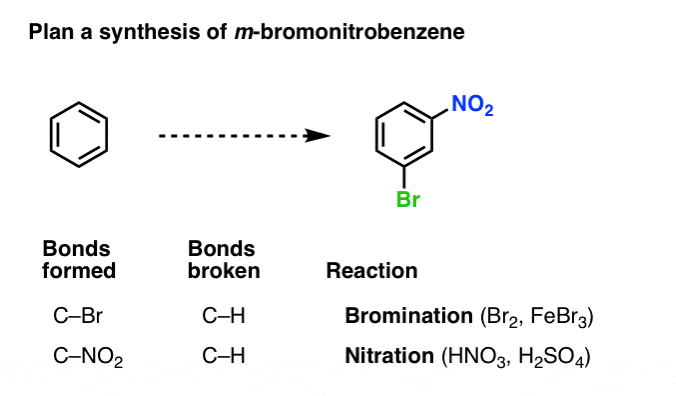 Nitrobenzene doesn’t undergo Friedel-Crafts reactions at all. 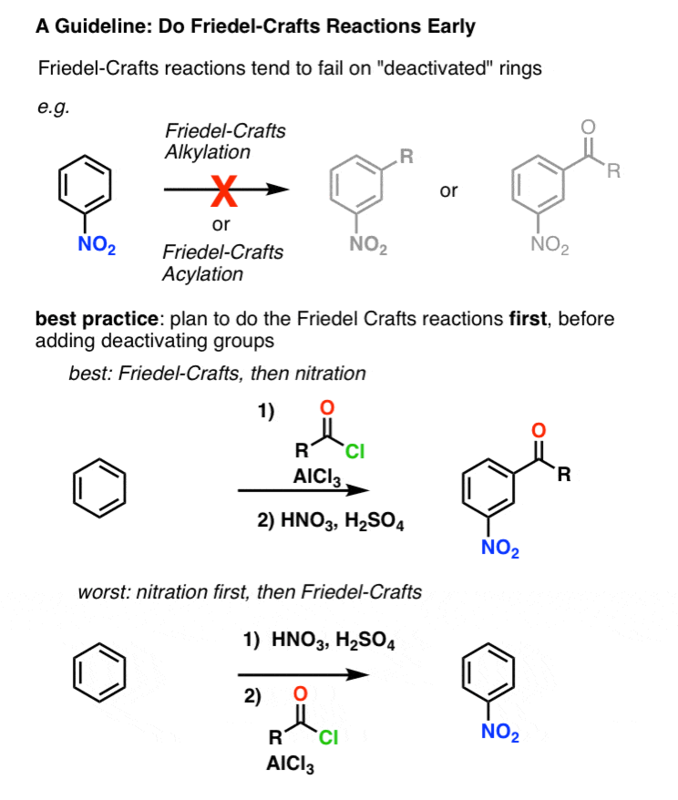 So given the choice of putting NO2 on first or performing a Friedel-Crafts reaction, do the Friedel-Crafts first.